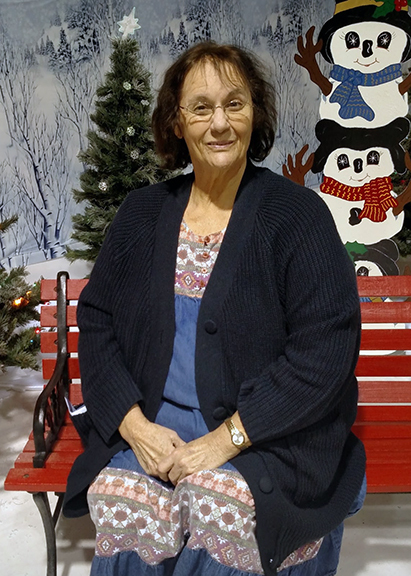 Nancy Jo Sanchez, 72, of Winnie, went to be with the Lord, Tuesday, March 26, 2019, at Baptist Hospitals of Southeast Texas, Beaumont. She was born on April 17, 1946, in Galveston, to Martha Sophie Viggo Kirkpatrick and Jewell Bryan Kirkpatrick. Nancy loved her church, family and grandchildren. She enjoyed doing word puzzles, and she was a good cook. Her favorite color was purple. Nancy loved her cat, “China”. Survivors include her daughters, Nancy Carr and her husband, John, of East Liverpool, Ohio; Kelli DeMoss and her husband, Dennis, of Winnie; Angel McCarley and her husband, Jason, of Columbia Falls, Montana; Wendi Clark and her husband, Chris, of Port Bolivar; son, Joe Bryan Sanchez, of Amarillo; grandchildren, Mindy Mack, Misty Brown, Mark Hodge, Jr., Noah DeMoss, Jonah DeMoss, Cade McCarley, Olivia McCarley, Sophie Clark, Benjamin Sanchez and Brooklin Sanchez; five great-grandchildren; brother, Ollie Mike Kirkpatrick, of Crystal Beach. She is preceded in death her parents; husband, Joe F. Sanchez; and grandson, Micah Hodge. A gathering of Mrs. Sanchez’s family and friends will begin at 9:00 a.m., with her funeral service to follow at 10:00 a.m., Friday, March 29, 2019, at First Baptist Church, 120 West Pear Avenue, Winnie. Her interment will follow at High Island Cemetery, High Island. Memorial contributions may be made to First Baptist Church, 120 West Pear Avenue, Winnie, Texas 77665. Some of the most precious memories of my Aunt Nancy and Uncle Joe were when we went to their place in Gilchrist. How I treasure those memories. I always enjoyed Aunt Nancy and her hospitality. Always making me laugh. May you rest in peace. I pray for all her daughters and son in this time of sorrow. God Bless you. So sorry for your loss, Now she is in the restful arms of Christ, God bless you all. My thoughts and prayers are with the family at this time. Ms. Nancy was dearly loved by our family. Amber and I still talk about all the good times they had with Ms. Nancy. She will be dearly missed by all that knew her.